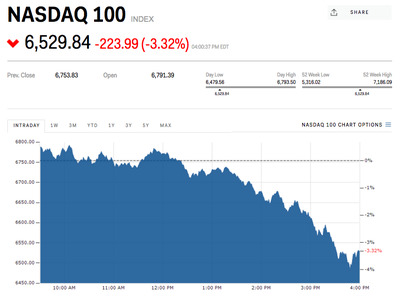 Stocks tumbled in afternoon trading on Tuesday amid reports that the Trump administration is considering a crackdown on Chinese investments into US companies. The new rules would focus on preventing Chinese investment into emerging technologies like 5G. Other ideas include “reciprocal” limits on investments into industries that China is already protecting. Follow US stock indexes in real time. The Trump administration once against fanned the flames of a global trade war on Tuesday amid a new report that it could move to block China from investing in certain types of US tech companies. Bloomberg reported Tuesday that as part of new sanctions on China – which included Thursday’s announcement of tariffs on $US50 billion worth of Chinese goods – the Treasury Department is looking into using a decades-old national-security law to prevent Chinese firms from investing in up-and-coming technologies. The market reaction was swift and unforgiving, first hitting tech stocks and spreading into other major US indexes throughout the afternoon. The tech-heavy Nasdaq 100 index bore the brunt of selling pressure, tumbling as much as 4.1%. Meanwhile, the benchmark S&P 500 slid more than 2.3% at one point, and the Dow Jones industrial average lost 2%. Semiconductor manufacturer and software companies – two areas with an outsized level of exposure to China – were among the market’s biggest losers on the day. On a single-stock basis, the biggest decliners in the S&P 500 were all tech firms, with Nvidia (-7.8%), Adobe Systems (-6.6%), Netflix (-6.1%), Lam Research (-5.7%), Micron Technology (-5.7%), and rounding out the bottom five. And while Tuesday’s tech pain doesn’t quite stack up to the selloff that rocked the sector last week, the industry’s increased vulnerability should be worrisome to traders, considering the market’s heavy reliance on tech throughout the nine-year bull market. Trump’s latest move marks the latest entry into his wide-ranging crackdown on US trade partners, which also included recent tariffs on aluminium and steel. Further, the president said last week that his administration would look at ways to limit Chinese investments into the US as punishment for its theft of intellectual property. The new possible restrictions would be created using the 1977 International Emergency Economic Powers Act, according to Bloomberg. The administration would place limits under the assumption that Chinese investment in these businesses would constitute an economic threat to US national security, with a focus on emerging tech like 5G networks and semiconductors. The reasoning would be similar to the Trump administration’s justification for blocking semiconductor Broadcom’s takeover of rival Qualcomm earlier in March. The Treasury Department is also mulling other steps, according to the report. Among the possible crackdowns is a “reciprocal” restriction in response to China’s protections of some industries. Currently, China limits foreign investment into some industries that its government is trying to grow domestically. So under the new rule, the US would also prevent investment in those industries coming from China to the US. For instance, since China places limits on investment into specialty chemicals, the US could move to do the same. Additionally, the administration is considering an expansion of the Committee on Foreign Investment in the US, a panel that reviews takeovers of US companies by foreign firms. Fears of a trade war with China were quelled on Sunday after reports suggested the Trump administration had entered into negotiations with the Chinese government to address concerns over the theft of IP and other trade issues. It is unclear how these new restrictions could play into those talks.